I'd like to introduce Linda McNutt ....creator of small, inspiring works of art made from bits of cloth and hours of hand stitching. The beginnings...Linda's first healing cloth in process. Patching, Stitching, Weaving: Creating Healing Cloth workshop in March 2015. Above is the first "healing cloth" (in process) that Linda started in the workshop. Linda and Ruth recently returned to Virginia for my Jumpstart in Hand Stitching workshop. At the end of the first day, Linda pulled out a selection of healing cloths. Seems that she caught the "stitching bug"! The entire class was astounded by these amazing jewels! I was fortunate to be able to purchase this particular piece from Linda. It really spoke to me. This final piece has a beautiful story. We didn't actually get to see it in person, but Linda told us about it and later sent me this photo with the story behind it. 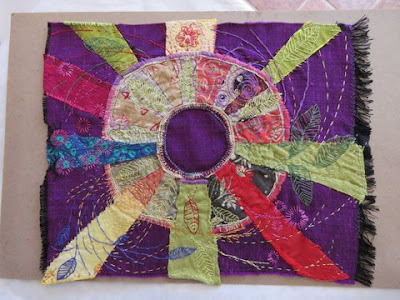 Linda created this piece for her friend Julie W., who is a psychotherapist as well as a healer. Her friend works with energy healing and channeling, prayer, astrology, and crystals. Linda's friend wanted a piece that would cover a person's chest for when she does her crystal healing work. When working with someone, she could lay it on their chest, or on another affected area of their body, then sometimes place crystals, or a laying on of hands. The antique quilt centerpiece has a very special story. The original quilt was given to Linda by a mutual friend of both hers and Julie's. This friend was also a therapist and Buddhist teacher and unfortunately lost her life to cancer. She was Julie's best friend and even though Julie didn't request it, Linda felt it seemed right to include something that evoked the love and energy of their friend from a quilt that lay at the end of her bed. Parts of the quilt block that were frayed and torn were mended or embroidered over to make them whole. 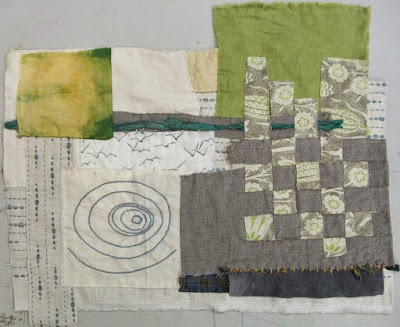 I found this a very powerful part of the Meditation and Healing Cloth (Patching, Stitching, Weaving: Creating Healing Cloth) workshop, by the way: the idea of mending, binding, patching, reweaving, with stitch and color. Perhaps not always able to keep the old, but transforming into something new. The circle is a symbol of unity and oneness, the wheel a reference to the wheel of life. As a "coincidence", the back of the stitching looks like an astrological chart. The leaves are about new growth, new flowering, spirals of energy radiate from the center. Other symbols came from an intuitive flow through meditation, and I tried to intentionally leave openings and opportunities for the healer and the individual to find their own meanings and purposes. Thank you Linda for sharing your beautiful, rich work with us! I will be teaching the next Patching, Stitching, Weaving: Creating Healing Cloth workshop on June 17 and 18. Click on the highlighted words for more information. Thank you Julie, for your kind words and all your inspiration. See you in March! Thank YOU for allowing me to share your incredible work! I can't wait to see you in March :)!